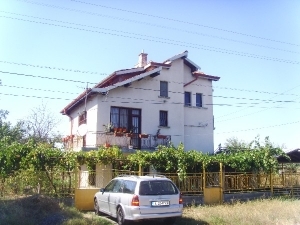 Wonderful property for sale – big house located in an attractive village is waiting to be your new home in Bulgaria. SECOND FLOOR: two bedrooms, a small kitchen, a bathroom, a big terrace /20 sq. m/. ATTIC FLOOR: The stairs to the attic floor are outside. There is an entrance hall, a bathroom and two bedrooms. GARDEN: The yard is 800 sq. m flat, rectangular, well kept with a lot of fruit trees planted there, a vine yard, a drill, an outbuilding and a garage.